It just uses the in game “ShowMines” function rather than having to write your own. So, for example 0xE would display flags. Fixed the timer now so that it only stops working if you have won the game. 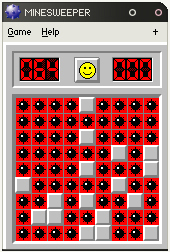 Got bored and trying to create an effective god mode in Minesweeper that will allow you to keep on playing even after you die. If I can get it all to work properly, I may make a small hack of the game that allows you to set a number of lives per game, and then you loose after hitting that many mines. Ill be updating the blog with posts as I research more. This little cave just checks to see if the game has been won or lost. If its been won, then it sets the gamestate to 0x10 (Game Over) else, it keeps the value as 0 and returns to the function. With the >’s representing a 1 Byte border, the *’s being mines, and -‘s being empty spaces. Knowing this, we can effectively create a loop that reads this memory, and checks if a square is a bomb or not. In order to calculate the size of the loop, we need to read the width and height from the game. These are stored at the two following addresses: 0x1005334 and 0x1005338. The maximum width of the board, is 0x1E, which is 0x20-2, 2 for the border. So, we now know that we can read each column by looping along the rows between 0 and nwidth, and the columns can be calculated by adding 0x20 to the address, each pass between 0 and nheight. So, now we have the loop sorted, we just need to check if the current address holds a mine, if so, display it to the user. The above is part of the code that is used in generating the minefield for the game. The game randomly calculates if the square is a bomb, and then at 0x010036FA, it OR’s the value of 0x80 with the default value, 0x0F, giving 0x8F. Where x = 0; the square is not a mine. Where x = 4; the square was clicked on. Where x = 8; the square is a mine. Where x = C; the square was a clicked on mine. Now, we can modify the assembly at 0x010036FA to set it to one of these values to show that there is a bomb there. Using the values above, this sets the opcode from OR BYTE PTR DS:[EAX],80 to MOV BYTE PTR DS:[EAX],8A. You would modify the image shown by changing the last byte of MOV to one of the values from the list. One thing to take into account however, is that this will require you to start a new game before the effects come into place, as it overwrites the values while the grid is being drawn out. At 0x01002FE7 you have an instruction that checks to see if the game is running. If the value is equal, then it jumps over. There would be many ways to effectively removing the timer, I have done it by changing the opcode of JE, to that of an short unconditional jump, 0xEB. The above code will either enable or disable the timer based upon the bool TimerCheat.